Our Campaigns - Candidate - John Conyers, Jr.
Info United States Representative John Conyers, Jr., a Detroit Democrat, was re-elected in November 2000 to his nineteenth term in the U. S. House of Representatives, winning 93 percent of the vote in Michigan's Fourteenth Congressional District. Mr. Conyers, a senior statesman in American political life, is respected and admired by colleagues on both sides of the aisle. Reserved and studious, he has quietly built a solid record of legislative achievement in his 35 years on the Capitol Hill. Mr. Conyers is the second most senior member of the House and is the Democratic leader on the House Judiciary Committee, where he continues to oversee constitutional, consumer protection, and civil rights issues. Mr. Conyers is one of the founders of the Congressional Black Caucus, and is considered the Dean of that group. The list of legislative accomplishments during Mr. Conyers time in Congress is long and impressive. He introduced the Hate Crimes Act, which would make it easier for federal authorities to prosecute racial, religious and gender-based violence. The Act passed both houses but was not sent to the president: it will be re-introduced in the 107th Congress. Among the many legislative initiatives of Mr. Conyers is the bill to examine the present-day effects of slavery, and the feasibility of reparations to be paid to African-Americans. The Jazz Preservation Act was introduced by Mr. Conyers in the 106th Congress. Mr. Conyers is widely known as one of Washington's patrons of the arts, especially jazz. It was he who introduced the House Resolution designating jazz as a national treasure. In 1990, Mr. Conyers won passage of a Resolution saluting Tap Dancing, and it was in that same year that he saw to it that funds were allocated to the Smithsonian Institution for its jazz programs. Representative Conyers wrote and led the drive for the Martin Luther King Holiday Act of 1983. He also wrote the Alcohol Warning Label Act of 1988, which requires clear notice on alcoholic beverages warning of the dangers of drinking while driving and during pregnancy. Mr. Conyers was the original sponsor of the National Voter Registration Act which passed the House and Senate in the 103rd Congress and was signed into law by President Clinton in 1993. The Conyers Chief Financial Officers Act of 1990 created CFO positions throughout the federal government to improve responsible handling of government funds and prevent scandals such as those at HUD and in the Savings and Loan industry. 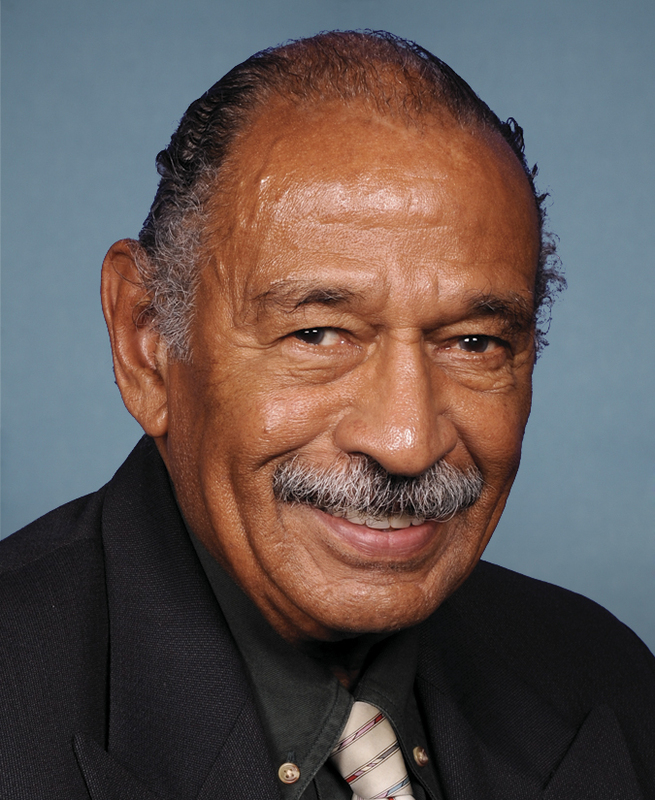 Representative Conyers was the primary author of legislation to raise the Environmental Protection Agency to cabinet status, as well as remedy the disproportionate environmental burdens on minorities. In both the 101st and 102nd Congresses, Mr. Conyers successfully blocked attempts to weaken the federal anti-racketeering law -- RICO. He helped lead the fight to bring the Civil Rights Act to the floor of the House and, over presidential opposition, bolstered support that led to passage of the act in 1991. The Asset Forfeiture Bill, introduced by Mr. Conyers, places the burden of proof on the government to demonstrate that seized property is indeed subject to forfeiture, creates an "innocent owner" defense, and permits a court to provisionally return property to its rightful owner when there is a clear demonstration of substantial hardship. Mr. Conyers helped society move into the digital age with the creation of the Electronic Signature Bill. The E-Sign bill gives the same legal status to contracts on-line (e-mail and Internet) as those on old-fashioned ink-and-paper. The families of police officers, firefighters and other public safety personnel killed in the line of duty will gain from the Public Safety Officers Benefits Act, which has doubled the benefits available to survivors -- another measure authored by Representative Conyers. Similarly, Mr. Conyers wrote the Victims of Crime Act, which raised the amount of money available to victims of violent crime by $40 million, money that is paid in fines and penalties collected from convicted criminals. An outspoken critic of violence against women, Mr. Conyers introduced the Violence Against Women Act, which passed in the 103rd Congress. This is historic legislation that contains a broad array of laws and programs to address domestic violence and sexual assault in our country. In April of 1999 Mr. Conyers introduced legislation aimed at racial profiling by law enforcement officers. The Traffic Stops Statistics Study Act makes mandatory a Justice Department study of racial bias in traffic enforcement. Another of Mr. Conyers' proud legislative achievements is The Church Arson Prevention Act. The bill, written by Representative Conyers, was signed into law by President Clinton five years ago. Its creation came about as a result of a rash of church burnings across the South. The President, and others, praised Mr. Conyers for responding quickly to the crisis and promptly organizing bipartisan support for the legislation. Mr. Conyers has long been a strong advocate of health care reform. In the 103rd Congress he co-authored legislation to provide comprehensive, universal health care for Americans. He commissioned the landmark General Accounting Office report which found that a Canada-style universal single-payer plan would save at least $67 Billion in administrative costs alone each year in the United States. The American Health Security Act, written by Mr. Conyers and Representative McDermott, was co-sponsored by 91 members of the House, the most sponsors of any health proposal of the 103rd Congress. During the 106th session, Mr. Conyers established a non-partisan Congressional Universal Health Care Task Force. This group works to develop and pass legislation to achieve comprehensive, affordable high quality health care for all Americans, and eradicate disparities in our health care system. Mr. Conyers also introduced the Quality Health Care Coalition Act with Rep. Tom Campbell. This bi-partisan legislation allows patients and their health care providers -- not an HMO administrator -- to make the best medical decisions regarding patient care by allowing health care professionals to collectively bargain through a limited exemption under anti-trust laws. As Chairman of the House Committee on Government Operations during the 103rd Congress, Mr. Conyers was responsible for a large number of management and procurement reforms. He led efforts to streamline and safeguard the budget process and spearheaded the saving of taxpayer funds by intervening in various misdirected or fraudulent government programs and contracts. He exposed more than $310 billion in wasted taxpayer funds in a widely cited report which was credited by then-Vice President Gore for presaging the Administration's 'reinventing government' initiative. In 1994 Mr. Conyers wrote sweeping reform legislation -- enacted in September of that year -- to change dramatically the federal government's $200 billion acquisitions system, reducing the bureaucratic process and requiring less expensive off-the-shelf commercial purchasing wherever possible. Through his investigations, Mr. Conyers revealed major abuses in military procurement, notably the failures -- previously unreported by the Pentagon -- in the performance of the Patriot missile in the Persian Gulf War; failures in the performances of the C-17 Airlifter and the B-1 Bomber; Northrop Corporations fraudulent involvement with the Harrier jump jet (also deployed in Desert Storm); the air-launched nuclear cruise missile; the Seawolf submarine; and Star Wars. Mr. Conyers was also successful in pressing the Department of Veterans Affairs to cut the processing time for claims by 41%, from 180 to 106 days. In addition, he forced the Federal Aviation Administration to suspend use of its $1.5 billion data processing system until it was determined satisfactorily that the system had been procured under a fair and open bidding process. Mr. Conyers was an influential member of the Judiciary Committee in its 1974 hearings on the Watergate impeachment scandal and has played a prominent role in the recent impeachment process as the only Judiciary Committee member to have served on both panels. Mr. Conyers has directed much of his effort and leadership at keeping jobs at home in the Detroit area, and working to improve health care for the people. He was instrumental in the designation of Detroit as an Empowerment Zone, much improving the chances of success for minority entrepreneurs in new and expanding small business ventures. Mr. Conyers has prevented several federal offices from leaving Michigan's largest city, and ensured that the new IRS and DEA offices were built downtown. The Detroit Free Press called his efforts "heartening", adding: "much of the credit for keeping the federal agencies downtown went to U. S. Rep. John Conyers." After campaigning for John Conyers Jr. in 1964, Miss Rosa Parks was hired by the then new Congressman to help staff in his Detroit office, where she worked until she retired in 1988 at the age of 75. It was Rosa Parks, of course, whose defiance of segregation on a public bus in 1954 sparked the famous Montgomery, Alabama transportation boycott- a milestone in the civil rights movement. As a brash backbencher on the House Judiciary Committee in the early 1970's, Michigan Representative John Conyers was enough of an irritant to the Nixon White House to earn 13th place on the Administrations original enemies list. John Conyers, Jr. attended public schools in Detroit and went on to earn a BA and then a law degree, both at Wayne State University. He is married to the former Monica Esters. Together, they have raised two sons, John III and Carl Edward.